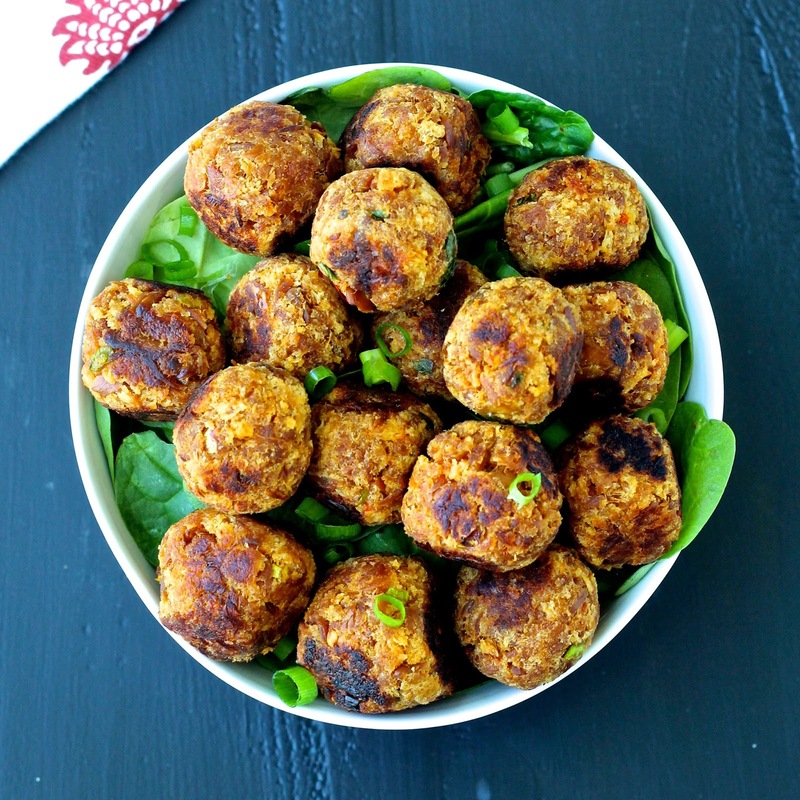 Packed with Asian flavors, these mini tuna meatballs are perfect for summer entertaining! Thank you Bumble Bee Seafoods for sponsoring this post. Try Bumble Bee Sensations® Seasoned Tuna or Bumble Bee® Prime Fillet® Gourmet Flavors Albacore Tuna in your recipes this summer! I love summer cooking, don’t you? When I think of summer recipes, I think of simple dishes that are easy to make and even easier to eat. I think of recipes that can feed a crowd for a casual backyard get-together, a picnic or even a trip to the beach. When summer comes around, I definitely prefer dishes that can be popped in the oven or cooked on a grill rather than those that involve sweating over a hot stove! Tomato & Basil and Lemon & Pepper. They’re great to add to your favorite sandwich or seafood recipes. They also come in ready-to-eat kits with crackers- perfect to take to work or anytime when you want a nutritious and convenient meal. 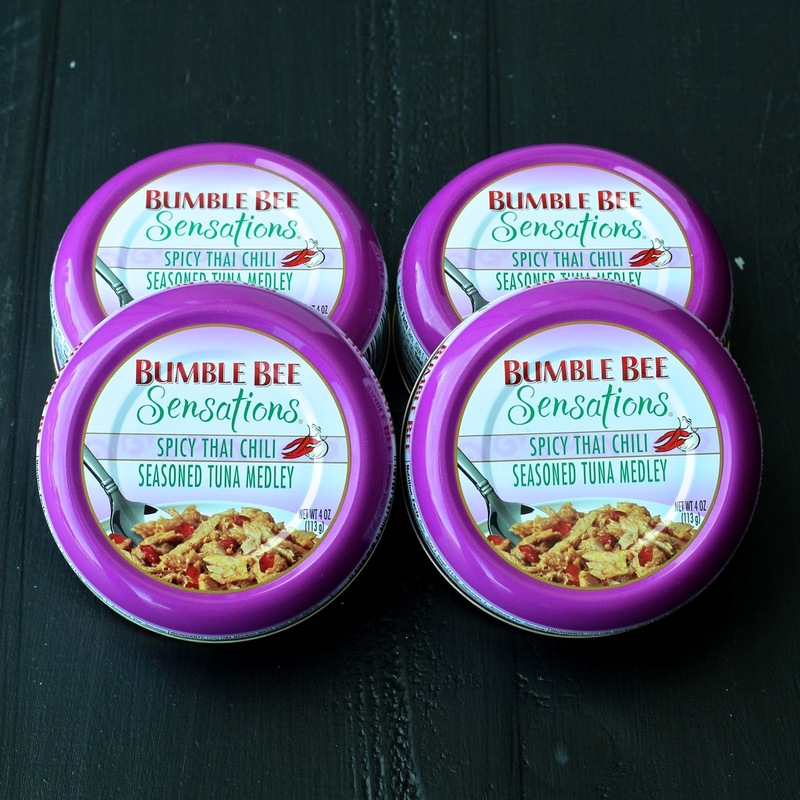 When I was challenged to make a summer-themed recipe using one of these products, I knew I wanted to experiment with the Bumble Bee Sensations® Seasoned Tuna Medley Bowl in Spicy Thai Chili. Seasoned with roasted garlic, onion, paprika and chili, this tuna is packed with flavor and just the right amount of heat! 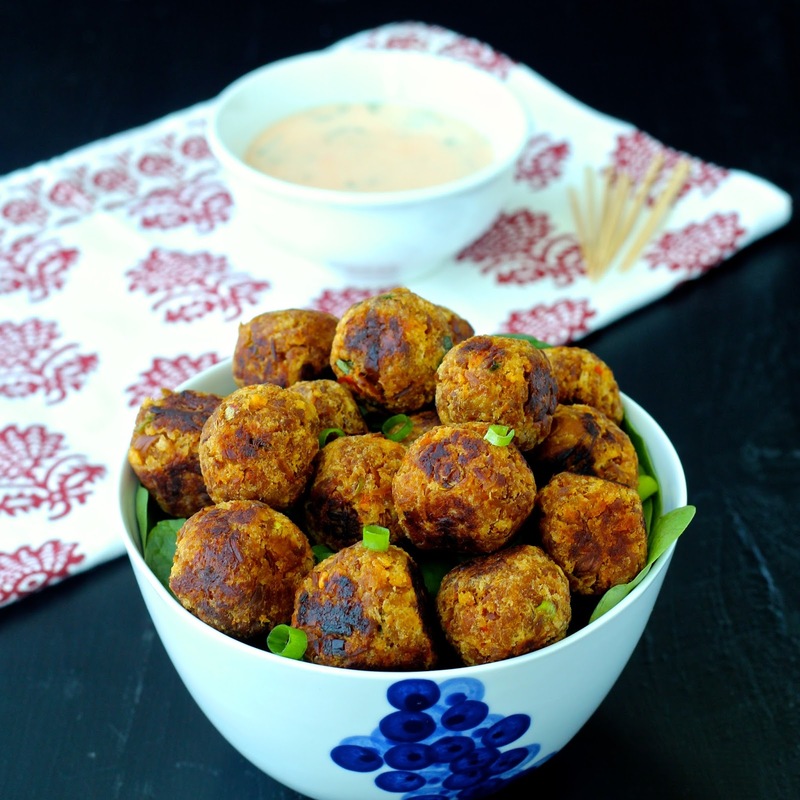 My Spicy Thai Chili Tuna Meatballs are a twist on the classic cocktail meatball. 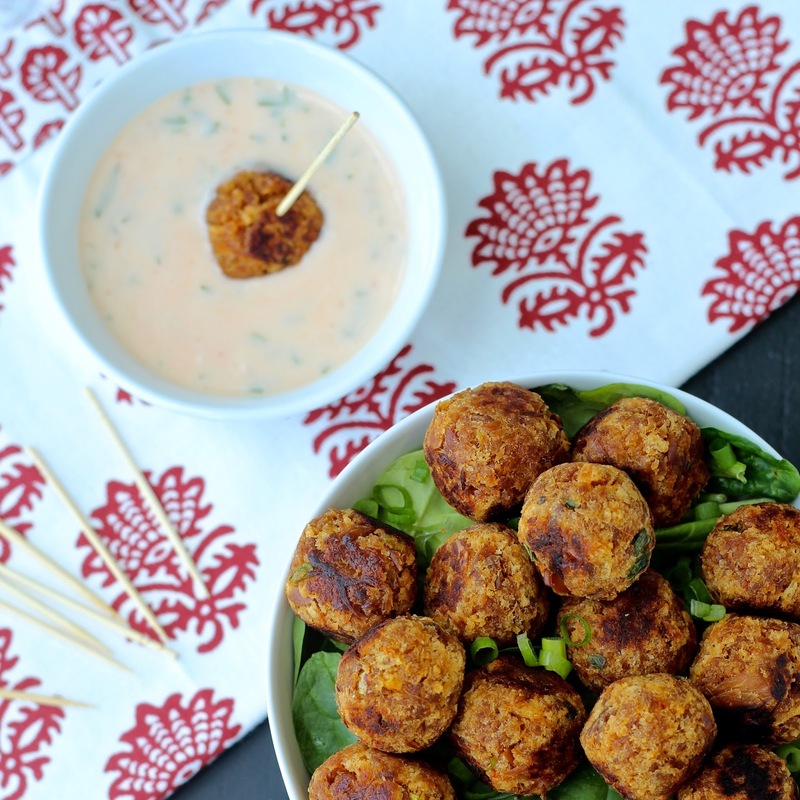 Packed with Asian flavors, these mini meatballs are perfect for outdoor entertaining. They’re bite-sized, so just pop ’em in your mouth and enjoy them mess-free. They’re also healthier than traditional meatballs because they use nutritious tuna fish, which is packed with omega-3 fatty acids, lean protein and plenty of vitamins and minerals. Because the tuna was already so flavorful, I didn’t need to add much to it. I mixed it with just a bit of scallion for bright flavor and an egg and panko breadcrumbs to hold the meatballs together. Rather than frying the meatballs over a hot stove, I simply popped them in the oven and in just 15 minutes, I had a whole tray of mouthwatering meatballs. To serve with the meatballs, I made a Creamy Thai Sweet Chili sauce. This cooling sauce has just the right amount of sweetness to balance the heat in the meatballs and it can be made while the meatballs are baking in the oven. This recipe makes about 16 mini meatballs but you may want to double the recipe if you’re feeding a crowd. Trust me, they won’t last long! Mix the tuna, scallions, egg and breadcrumbs together in a large bowl. Form the mixture into small meatballs, about 1 heaping tablespoon each. If the mixture seems to wet, add more breadcrumbs as needed. Coat a baking sheet with the olive oil. Place the meatballs on the baking sheet and roll them around to coat them with the oil. Bake in the oven, turning the meatballs occasionally, until browned on all sides, about 15 minutes. While the meatballs are baking, make the Creamy Sweet Chili Sauce by mixing the Thai sweet chili sauce, sour cream, cilantro and lime juice together in a small bowl. Arrange meatballs on a serving platter with the dipping sauce on the side. What are your favorite recipes using Bumble Bee products? Leave a comment below and share it with us! How fun are these!! They make me think of little crab cakes, only with tuna! Trying these is a must for me! 🙂 Great recipe!! I am, for serious, completely in love with this recipe. <3 Definitely gonna need to make these in a couple weeks! :D!!! Thanks so much Farrah, enjoy!! Thanks! I can't wait to see yours, I'm sure they're super delish! How very interesting, I had no idea the tuna folks were flavoring tuna these days. I'm typically not keen on shelf stable / canned meat products (spam, chilli, beef ravioli), but I'm curious to give this a try. And your recipe looks great! Thank you! And I hear ya about shelf stable products, but this tuna was really tasty! I love using canned tuna for tuna melts— and now I need to try a tuna meatball! Thanks for the delicious inspiration my friend! What a creative recipe! Perfect for those nights when you just want appetizers and a chilled glass of wine for dinner! I have the craziest obsession with Bumble Bee TUNA! OMFG! YUM! Thanks Anu! They really were flavorful and pretty spicy! Definitely will be making these soon! Awesome idea, Sonali! I made once fried tuna meatballs for pasta, and they were good. However, I do love you baked them – that's much better! Love the idea of serving them along with the dip sauce too. Nicely done! Thanks Ben, I'm sure yours were great too! But yeah, I definitely prefer baking over frying when possible. Thanks so much Natalie! I hope you like them, they definitely have a lighter feel than traditional pork or beef meatballs. Sounds really nice. Thanks for sharing, will be giving this recipe a go.